The arrival of Harmony of the Seas to the United States hasn’t gone unnoticed, but then again how could you overlook the biggest cruise ship in the world. 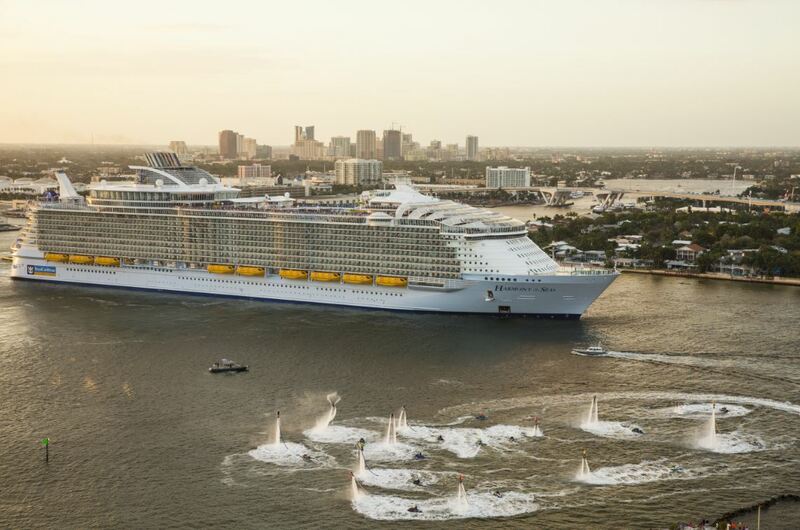 Just before reaching her new permanent homeport of Port Everglades in Fort Lauderdale, Florida, she was greated by her twin sisters Oasis of the Seas and Allure of the Seas for a one-off family reunion. Having just finished a long transatlantic crossing from her former homeport of Barcelona, Harmony of the Seas has now departed on her maiden voyage. 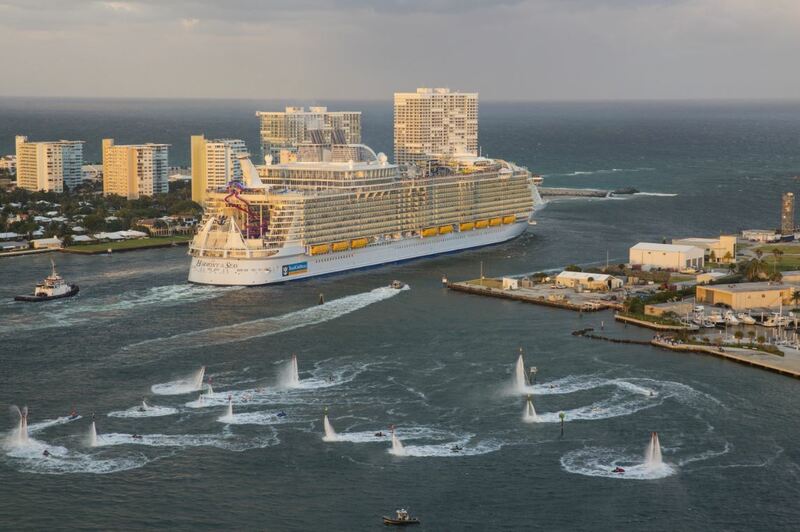 To celebrate the event, the world’s most adventure-packed ship received a bon voyage send-off from a flotilla of 16 jetboard and jetpack riders, as she left Port Everglades on a short three-day trip prior to her official christening by her godmother Brittany Affolter on thursday. You can read more on Harmony’s godmother in our previous post Brittany Affolter a Royal Godmother by clicking here . 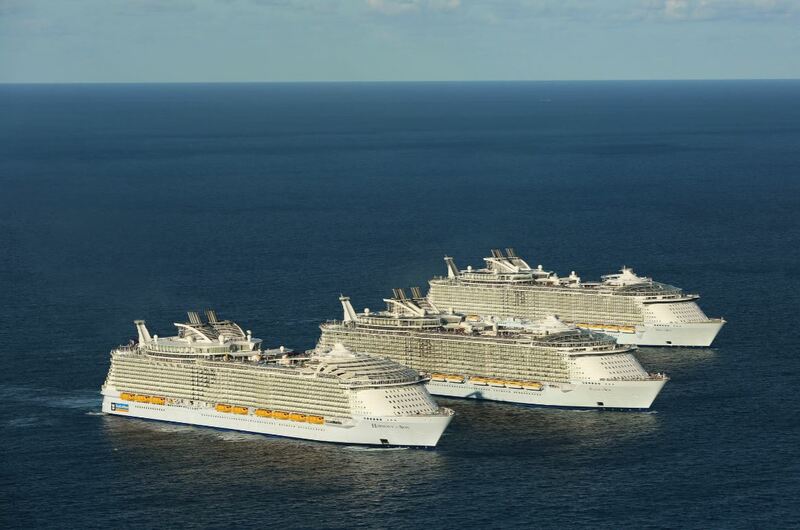 Together with sister ships Oasis and Allure of the seas, homeported in Port Canaveral and Port Everglades, Harmony will offer seven-night Eastern and Western Caribbean cruises, providing exciting adventures from the islands of the Caribbean to the shores of Mexico. Built on the same platform as her two sisters, Harmony of the Seas spans 16 decks and weighs 226,963 gross tons. She can accommodate 5,497 guests (at double occupancy) in 2,747 staterooms. Harmony of the Seas combines the iconic seven neighourhood concept that the Oasis-class ships are known for with some of the most modern and groundbreaking amenities and offerings. Ranging from the Ultimate Abyss, a dramatic 10-story tall slide, to high diving performances in the Aqua Theater, sophisticated dining in Jamie’s Italian to the whimsical Wonderland with its unique culinary adventure for the senses, and robot bartenders in the Bionic Bar Harmony of the Seas has all the ingredients to ensure travellers will experience the vacation of a lifetime.